This is a sponsored post written by me on behalf of Campbell’s Slow Cooker Sauces. All opinions are 100% mine. Since things are cooling off outside, I’m trying to get the absolute most out of the daylight hours. Meeting friends for drinks after work, attending some local food events, all of the million festivals that are squeezed into the season. These are all great reasons to be out of your own kitchen for a bit of fun in the little bit of sun that is left. Enjoy that time out and about while your dinner is being cooked for you at home. 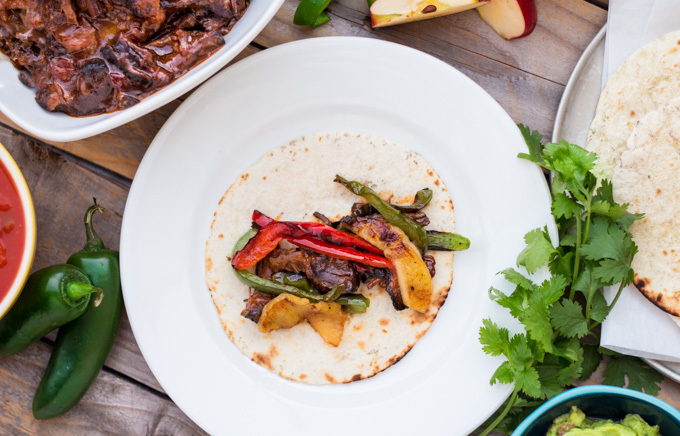 We’re pulling out that trusty slow cooker for a deliciously simple Apple Bourbon Steak Fajitas recipe. PS- Less. Than. 5. Ingredients. — Seriously. While I really do love to come home and cook dinner myself, there are busy days when I just don’t have it in me. Those are the days when I turn to the slow cooker. Toss some simple ingredients in before leaving for work and come home to a great, warm meal. Yes and yesssss, please. There’s something really comforting about putting in minimal work, the slightest bit of planning, and coming home to a dinner that is packed with flavor and tenderness from hours of slow and low cooking. I can remember seeing the crockpot out on the counter before I left for school when I was a kid. I totally get it now. While I definitely have been pulling the slow cooker out more often for myself, it really shines when it comes to feeding a crowd. There’s nothing worse for a home chef than stressing over preparing enough for for a small get-together. Forget all of that work. Pop it in the pot and just simmer down for a bit. 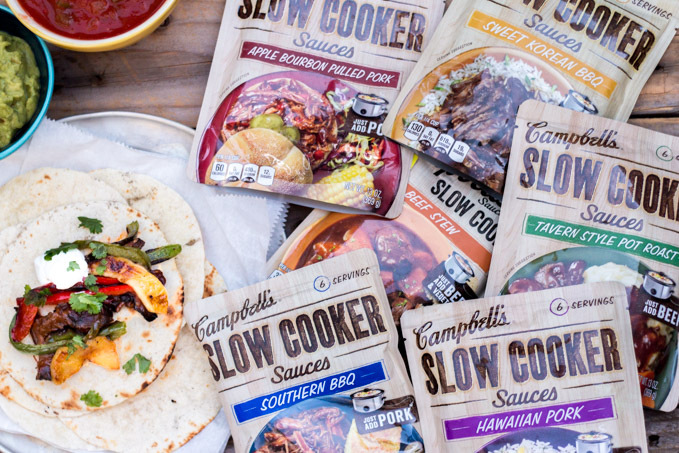 When I was playing around with slow cooker recipes that would fit the comforting food requirement that my friends have come to expect at my house, I discovered these Campbell’s Slow Cooker Sauces. Everyone knows Campbell’s. Great quality and easy to use. These slow cooker sauces couldn’t be any simpler. 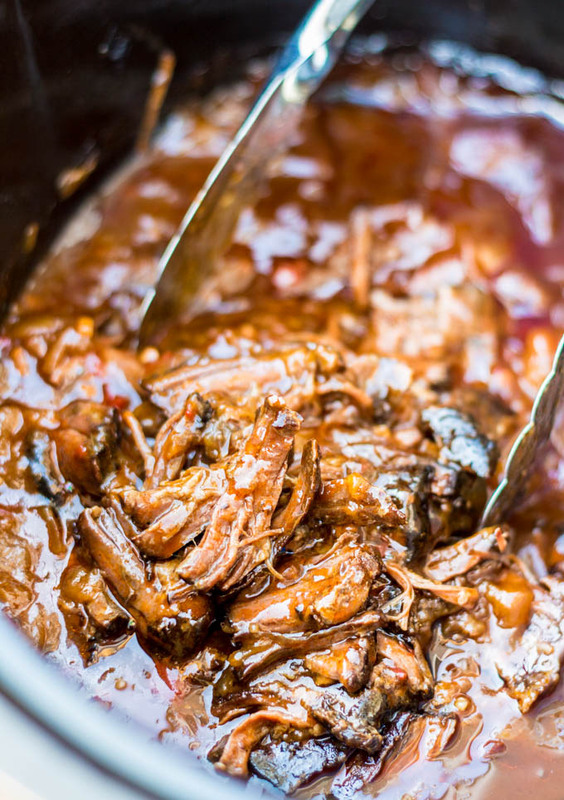 You (literally) can just place your meat in the crockpot and pour any of the 6 varieties of sauce (Tavern Style Pot Roast, Apple Bourbon Pulled Pork, Beef Stew, Southern BBQ, Sweet Korean BBQ, Hawaiian Pork) on top. Turn it on and head out the door. You can stick to the super simple pour and go routine, or you can add your own flare, still with minimal prep time. My top choice for using these quick sauces are for game day get-togethers. Super simple, little effort, great party food flavor. Since I had a few minutes to spare before heading to work, I seared an extra flank steak that I had recently picked up at the Farmer’s Market here in Nashville. I bought this steak thinking that I would use it for some simple tacos on a lazy day. I mean, tacos make any busy, stressful day juuuuust fine. Why not make something pretty similar to the original plan? Steak fajitas for the win. I gave the steak a very quick sear on a super hot skillet and tossed it straight into the slow cooker. Tossed some chopped onions and apple slices (Yes, APPLES!) for some added texture into the same skillet and tossed them around for just a minute or two to give them a nice caramelized layer. Tossed a bit of water in the pan to get all of those tasty bits up from the pan and poured it all on top of the steak in the cooker. I grabbed the Campbell’s Slow Cooker Apple Bourbon Sauce, because it’s APPLE BOURBON SAUCE. Need I say more? 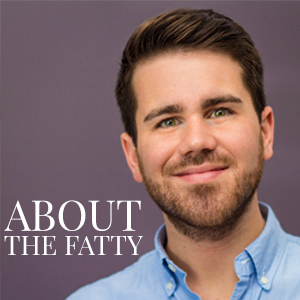 Poured it on top of the steak and apple/onion mix, threw the top on, set it to low and walked straight out of the door. Even with a few extra prep steps, I had this in the pot and cooking in less than 5 minutes. The second I walked into my house after work I could tell that this was a huge success. The smell of tender BBQ greeted me at the door. That’s the fragrance of happiness that I can remember from growing up. Hours and hours of slow cooking, ready for you (and your friends, if you let them) to enjoy without all of the trouble. The steak shredded perfectly. It just all fell apart. 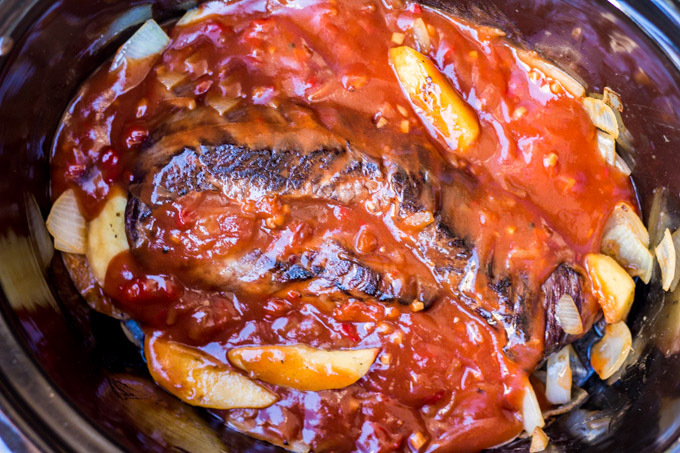 The sauce had reduced beautifully to a thick glaze-like consistency that was hugging the onions, apples and flank perfectly. I didn’t have to do anything except stir the pot (which I’m great at) to have the base of my fajitas ready to go. Since the recipe requires basically zero extra work on your part, this makes for the perfect Game Day ready bite. You can cook the main dish while you are away at work, out roaming the town, or while you fill the cooler for tailgating. Pull the lid off of the pot, line up some fixins, and you are golden. Nobody wants to be running around in the kitchen when they could be pre-gaming with friends. Plus, once the game starts, I’m pretty sure bourbon is what people want to eat anyway. 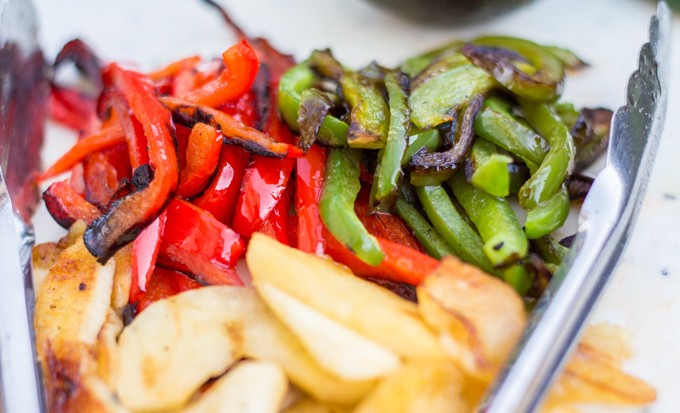 Once some friends arrived, I flamed the grill and threw on some peppers and more apples. The extra apples gave a great, unique and sweet textured bite to the fajitas. If you’re feeling froggy, I can personally attest that tossing the peppers and apples in a little extra bourbon on the grill isn’t awful AT. ALL. This ended up being one of the most simple, delicious party bites that I have made yet. So much so, that I managed to hide a bit of the apple bourbon steak to repeat again tomorrow for myself. Sorry, not sorry, friends! It pays to be the chef. Even if you didn’t really have to do any work to make it. This is so simple, that I’m not sure I can even call it a recipe. Spend that extra time enjoying the season with your friends and family. Visit Campbell’s Sauces for some great recipes and grab a Buy One, Get One coupon to try it out for yourself! 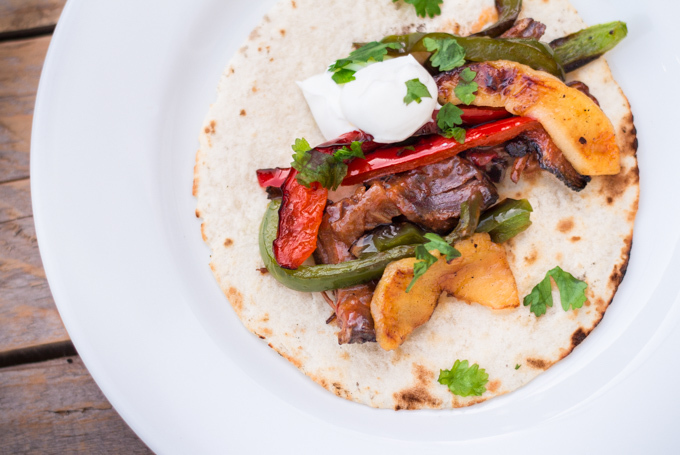 Super-simple slow cooker / Crockpot recipe for perfectly tender Apple Bourbon Steak Fajitas using less than 5 ingredients! Pull out the slow cooker and have it ready. Heat a skillet over high heat. I prefer cast iron for a better sear. 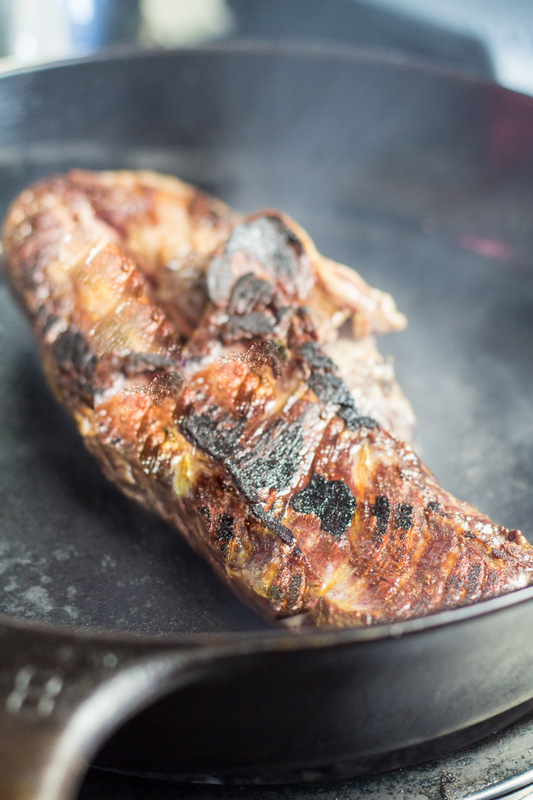 Brush the flank steak on both sides with some oil. Salt and pepper well. Cook steak on both sides until well-seared. Remove steak and place in slow cooker. 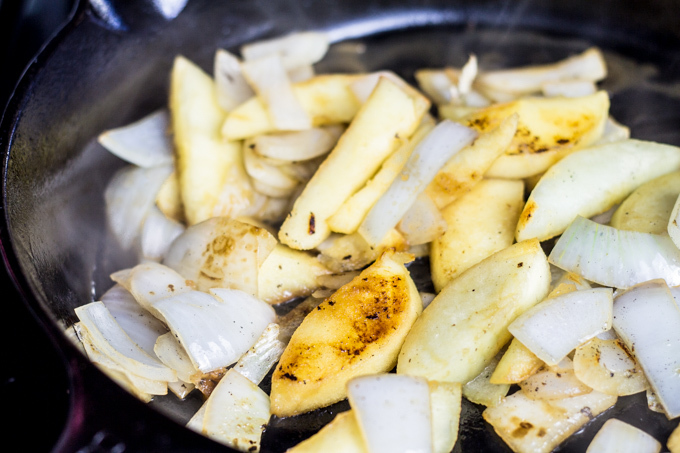 Throw onion and apple slices into skillet (still on high heat) and stir often to prevent burning. Cook for a couple minutes until you have some nice caramelization on the mix. Pour into slow cooker on top of steak. 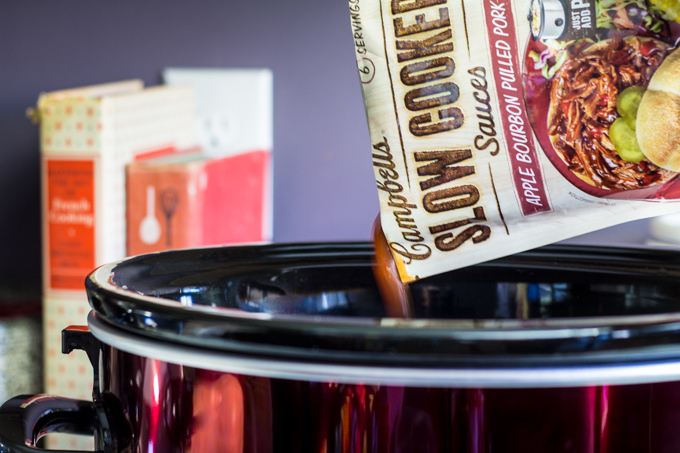 Add entire packet of Campbell's Slow Cooker sauce to slow cooker. Close cooker with lid and turn on low setting. Toss steak in sauce but stirring lightly. 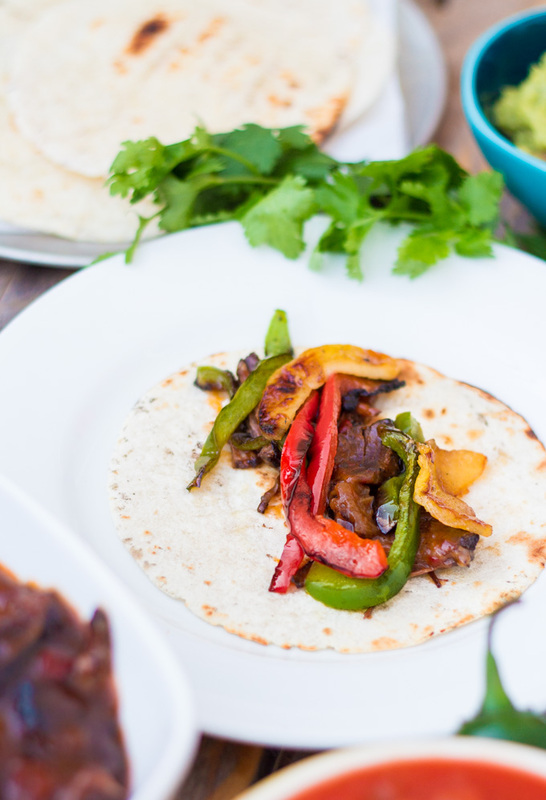 Prepare any additional items for your fajitas by personal preference. I prefer to make several add-ons for a party, such as guacamole, salsa, cheese, sour cream and allow guests to prepare their own. 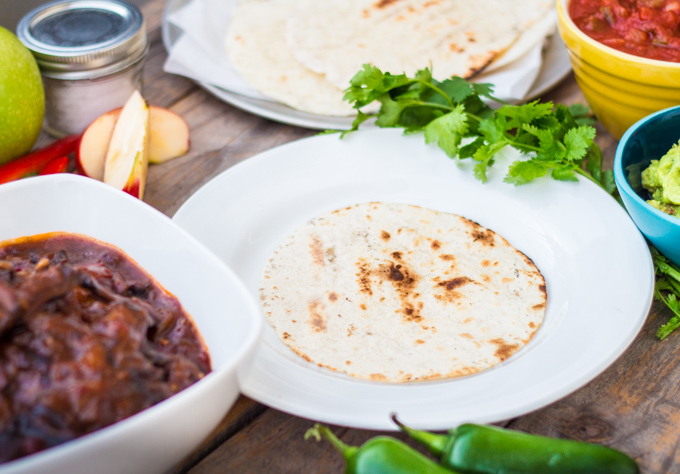 Combine on a tortilla and enjoy! Did you know that Campbell’s Slow Cooker sauces are awesome for game day gatherings with friends? 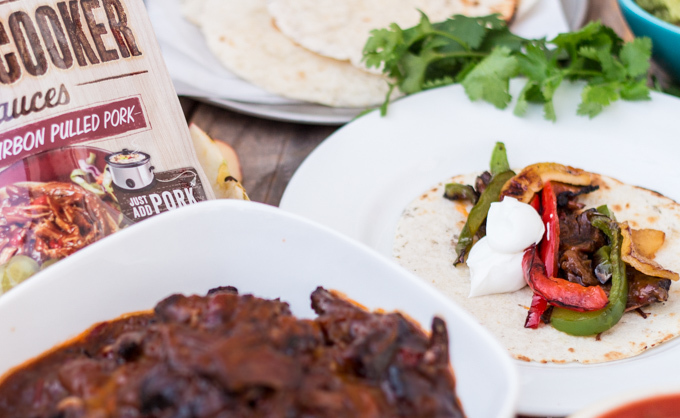 Meals with Campbell’s Slow Cooker sauces are delicious and so easy to make. Just 5 minutes of prep time is all it takes. Take the Game Day Great, Every Day Easy Challenge and experience it for yourself.